Great thanks to my hostess for having me here today! When brainstorming ideas for this blogpost, Ceri suggested I speak about my relationship with Carroll’s stories, which is a deep and lifelong one. I honestly can’t recall a time when I wasn’t familiar with Alice’s Adventures in Wonderland and Through the Looking Glass. 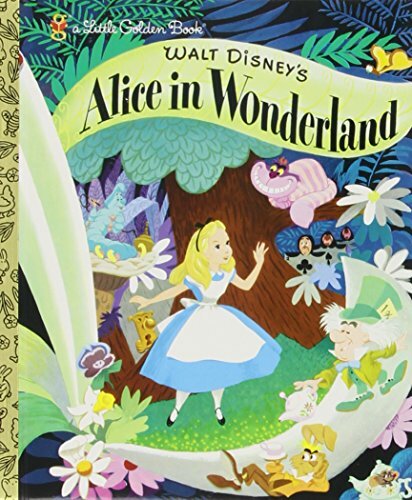 I had a Little Golden Books edition of Walt Disney’s Alice in Wonderland as a very young child, but I suspect I knew the characters well before any written version of the tale. I had a VHS copied from TV of the 1972 version of film, staring Fiona Fullerton as Alice (Peter Sellers was the March Hare and Dudley Moore was the Dormouse – you can see it on YouTube), which I must have watched a thousand times. I also frequently rented the 1951 Disney animated classic and a 1982 film version of a theatrical production (also available on YouTube) from my local video store. It was a story that fascinated my young mind and of which I simply could not get enough. Then I experienced the seminal television event of my childhood: the broadcast of a two-part, made for TV Alice in Wonderland in 1985 on CBS. I remember looking forward to it for weeks, and another girlfriend of mine and I both taped the entire thing so we could watch it over and over again (I recall being so proud that my version skipped the commercials, though it did make for some choppy transitions). 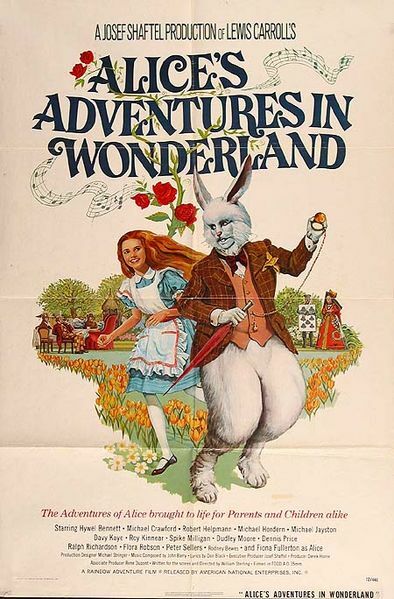 The movie was jammed packed with famous faces: Sammy Davis Jr. as the Caterpillar, Carol Channing as the White Queen, Ringo Starr as the Mock Turtle, and the list just goes on and on. Truly an all-star cast. 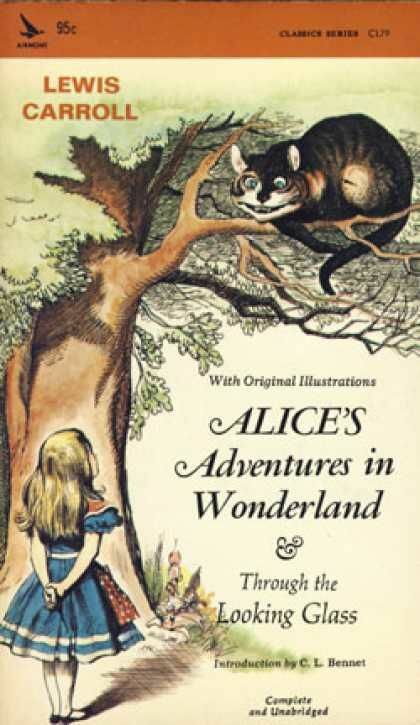 It is also a lot more child friendly than many versions of the story, being quite a bit less nightmarish, and it includes the entire Through the Looking Glass story line, with which I was previously unfamiliar. The film is available on DVD and well-worth adding to your collection. It provided me with the impetuous to go to the library and read the original books, turning my hitherto largely cinematic obsession into a literary one. A few years later I found a 1965, unabridged paperback of the book by Airmont Publishing, complete with the original illustrations by John Tenniel, at an antique store I was wandering with my mother. I paid 10¢ for it. It was my first used book in what has become a rather massive collection, and it was this copy that I kept by my side for reference when writing Darcy in Wonderland. I could easily have referenced the text online, or used a more recent publication (I have several in much better condition), but I wanted this old friend along for the journey. Here is an excerpt from my story, complete with a reference to Austen’s juvenilia, which the well-read Janeite should immediately recognize. Enjoy. It was an odd-looking assemblage that gathered on the bank — the birds with draggled feathers, the animals with their fur clinging close to them, and all dripping wet, cross, and uncomfortable. Squawks and complaints were in abundance. Darcy could not imagine even an overturned boat of society matrons creating a bigger cacophony. The first question was how to get dry again. This seemed to be the common consensus and the sole concern of the creatures. No matter how he attempted it, Darcy could not get anyone to tell him where they were or if there were any human habitations nearby, nor prevail on one of them to act as carrier should he somehow manage to compose a letter. Indeed, a few of the birds seemed rather insulted by this last suggestion, and so Darcy gave up on finding any help amongst such fellows. He would have liked to search elsewhere for assistance, but Alice was in the thick of the debate on how to get dry, and he could not extricate her. She seemed to find it quite natural to speak to the varied animals, and she went about it as comfortably as if she had known them all her life. Her father’s manners were not as fluid. He thought it extremely disconcerting to socialize with beings he was accustomed to staring at either through his rifle sight or only in history books. Yet there was Alice, arguing with the Lory as if it were one of her sisters. Darcy had to look twice when the bird turned sulkily to Alice and said, “I’m older than you and must know better.” Alice, meanwhile, was demanding to know how old it was, which it positively refused to tell, until there was finally no more to be said. At last the Mouse, who seemed to be a person of some authority amongst them, called out, “Sit down, all of you, and listen to me! I’ll soon make you dry enough!” They all sat down at once but for Darcy, who was soon in the awkward position of finding himself the only one standing. “Do sit down, Papa,” urged Alice. “I am sure I shall catch cold if I do not get dry very soon.” He almost commented that the air was warm and unlikely to cause her any harm, but instead gave into overwhelming mental exhaustion and meekly took a seat on the ground. “Ugh!” said the Lory with a shiver. The Mouse did not deign to notice the question and proceeded with his recitation: “‘Be this as it may, he did not live for ever, but falling ill, his son the Prince of Wales came and took away the crown; whereupon the King made a long speech, for which I must refer the Reader to Shakespeare's Plays, and the Prince made a still longer. Things being thus settled — ’ How are you getting on now, my dear?” it paused to ask, turning to Alice as it spoke. “What is a Caucus Race?” asked Alice. “Why,” said the Dodo, paying Darcy no mind, “the best way to explain it is to do it.” It proceeded to mark out a race course in a sort of circle (“the exact shape doesn’t matter,” it said), and then all the party were placed along the course, here and there. There was no “One, two, three, and away!” but they began running when they liked, and left off when they liked. “When did you develop this deep concern for a cold?” he asked. 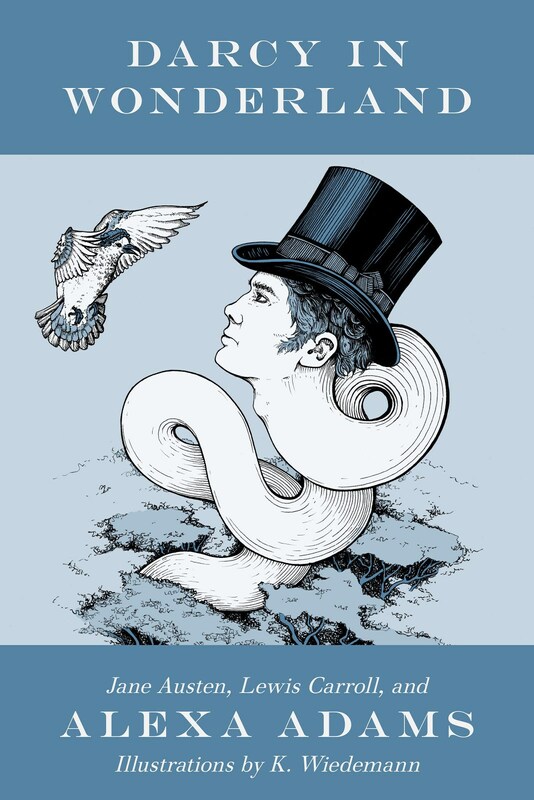 “As do I,” Darcy replied, yet for some inexplicable reason he would wonder at for years to come, they began to run again instead of withdrawing from the rather pointless competition and seeking a solution to their predicament. Thanks again to Ceri for participating in the blog tour. It’s been a pleasure. Thank you so much for dropping by, Alexa! This is such a fun idea for a mash up, because the Mr Darcy we know has a tendency to be on the serious side and Wonderland is not a serious place at all! Alexa Adams has been a devoted reader of Jane Austen since her childhood. She is the author of Tales of Less Pride and Prejudice (First Impressions, Second Glances, and Holidays at Pemberley), The Madness of Mr. Darcy, Emma & Elton: Something Truly Horrid, Jane & Bingley: Something Slightly Unsettling, Becoming Mrs. Norris, and the short story collection And Who Can be in Doubt of What Followed? : The Novels of Jane Austen Continued. Alexa is an American ex-pat residing in Switzerland with her husband and daughter. She is a founding member of the Jane Austen Society of Switzerland and looks forward to continuing her engagement with Austen and the remarkably familiar characters she has bequeathed to this world. Oh dear, poor Darcy! He is so not in control! It must remind him of trying to get Elizabeth to marry him?��. I hope they do find a way home before Elizabeth is too worried. Love this excerpt, thank you so much. 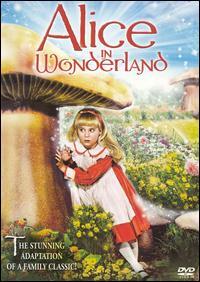 Hi Glynis, Darcy is the last person you'd expect to see in Wonderland, which is what makes it such fun, isn't it! I have read Caroll's books several times but I don't think I have seen any of the adaptations. The books sounds like fun. Hi Vesper, I am pretty sure I saw the Fiona Fullerton one, but I haven't seen any of the other adaptations, as far as I know. It's a fun idea for a book isn't it! Thanks so much for hosting me today, Ceri! I've long wanted to visit. It's lovely to be able to host you Alexa, thanks for visiting! Loved this excerpt! This book sounds so different from any I've read before.Can't wait to discover how Darcy and Alice return to the world and home they hold dear! Best of luck with your book,Alexa! Hope you have enjoyed the blog tour as much as we have enjoyed following you. Blessings on the launch and success of this book. I know you are especially proud of it. Thanks Jen. Isn't Alexa's sister's artwork amazing! 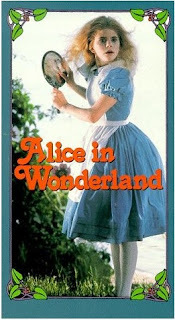 I shouldn't be surprised about all the adaptations made for 'Alice in Wonderland'! I just had no idea they were out there! Loved the excerpt and the concern Alice has for her mother. Looking forward to reading this delightful variation! Hi Carole, I didn't realise there were so many either! Glad you enjoyed the post. Poor Darcy, so bewildered! Can't help but feel sorry for the poor chap. But at the end if the excerpt, I get the feeling he's starting to learn to go with the flow. I'd no idea that there were so many adaptations of Carroll's works! I think I've only seen three: the Disney one (many, many years ago), the one with Fiona Fullerton (also rather a long time ago) and then the more recent one with Johnny Depp as the Mad Hatter. Thanks for sharing this excerpt with us, Alexa. Thanks for commenting, Anji! I haven't seen the recent one with Johnny Depp, but thinking about it, I probably have seen the animated one. My main memories of this work are in anthologies, quite often a part of it would be included such as Tweedledum and Tweedledee, or the Walrus and the Carpenter etc. This is one I definitely want to read as I have so enjoyed her other books.